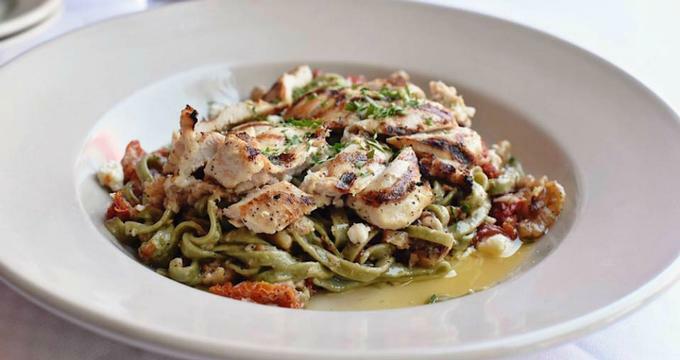 Starting as an Italian pasta shop and delicatessen in 1983, Mangia Italiano in St Louis has evolved into a full-service Italian restaurant currently owned and operated by former patron Chef James Bonsanti. The evolution of Mangia Italiano included not only a complete revamping of the brick-and-mortar portion of the restaurant, but also a complete overhaul of the current menu. Patrons can now enjoy a number of classic Italian dishes that are accented with decadent sauces, delicious seafood, and wild game, with a menu that is complemented by signature cocktails and local draft beers. · Main Menu - Includes an assortment of appetizers, sandwiches, classic and specialty Italian dishes, soups, salads, burgers, and desserts. · Pizza - A variety of 10-inch gourmet pizzas such as Di Verdure, Persephone, The Carnivore, margherita, and Campagnolo. · Late Night - Offerings of several late-night quick bites, such as slices of pizza, house-made chips, and drink and food combos. · Brunch - Brunch staples such as buttermilk waffles, eggs Benedict, breakfast pizza, egg sandwich, and more. Mangia Italiano offers live music several nights a week starting at 11:00pm. There is no cover charge to enjoy live music at Mangia Italiano. A full listing of the current music offerings by date is available online via the Mangia Italiano website. Mangia Italiano is a perfect place to host a private event. From birthday parties to corporate events, Mangia Italiano can help guests create the atmosphere desired for their personal event. Mangia Italiano also has a game room that can be rented out separately, where patrons can enjoy pool tables, old school arcade games, a flat screen TV, and a newly built bar. The game room can accommodate up to 28 people and is often rented out for a variety of celebrations. For more information on hosting a private event, contact Mangia Italiano by phone at (314) 664-8585. Mangia Italiano is pleased to offer its full-scale menu and exceptional hospitality and service for any catered event. Mangia Italiano will work closely with customers to create a menu that accommodates all tastes and palates. More information about catering services can be obtained by calling the restaurant directly. Give the gift of exceptional Italian food served in a warm inviting environment with a Mangia Italiano gift certificate. Mangia Italiano gift certificates can be purchased on site at the restaurant.